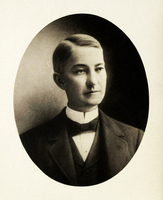 Arthur Amos Noyes kept food and a cot in his office to ensure uninterrupted work. Aerial view of campus featuring Throop Hall and the Gates Laboratory of Chemistry, c. 1919. Original rendering of the east side of the Gates Laboratory of Chemistry (now Parsons-Gates Hall of Administration). Gates Laboratory of Chemistry under construction, 1916. Windows of the Gates Annex library, with columns featuring Mayan Revival reliefs of animals and people. 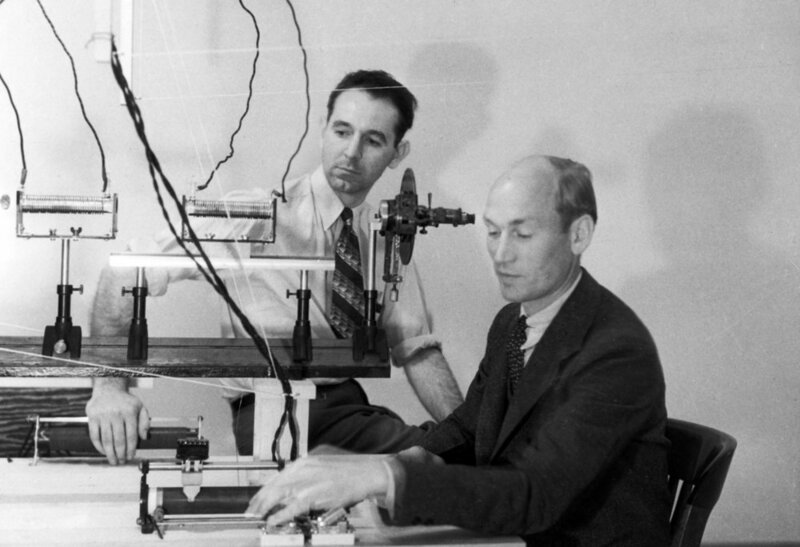 Arnold Beckman and colleague James McCullough at an optical bench, 1934. Commencement on the steps of Gates, 1917. 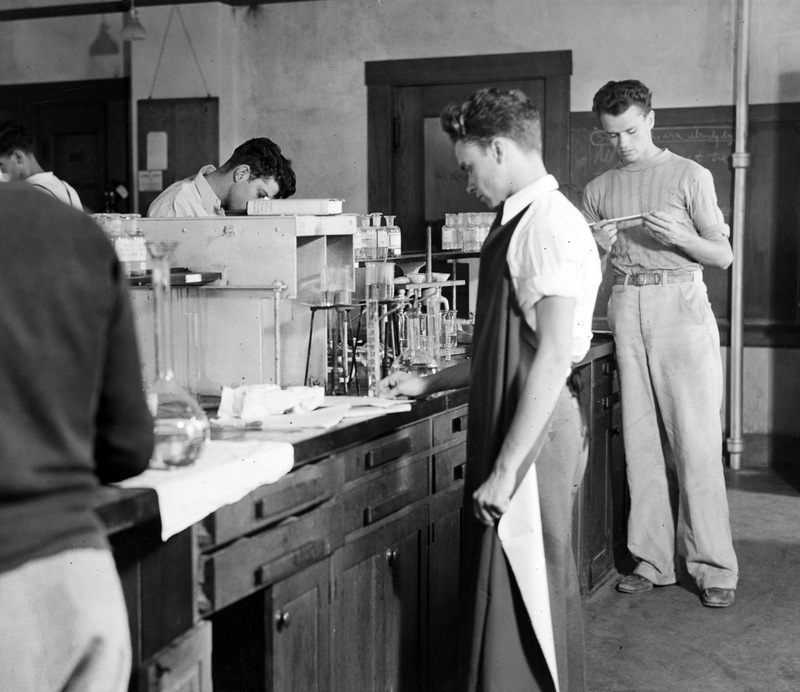 Sophomore chemistry class in Gates, 1935. 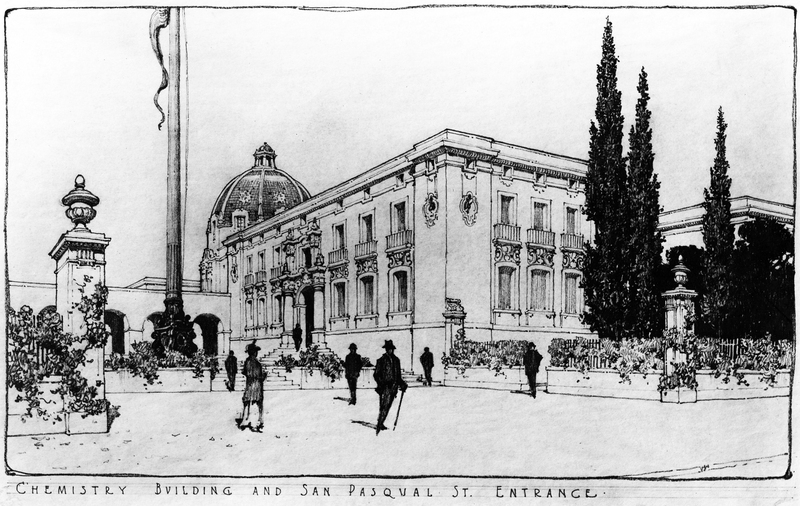 The building we now know as the Parsons-Gates Hall of Administration opened in 1917 and is the first on campus to cross the hundred-year threshold. Originally constructed as a means to persuade chemist Arthur A. Noyes to come to Pasadena, the Gates Laboratory of Chemistry was the first home of what would become Caltech's Division of Chemistry and Chemical Engineering (CCE). A new exhibit celebrating the building's anniversary features the building's original blueprints, dissertations by the first male and female students to earn PhDs at Caltech, a pH meter designed by Arnold Beckman, and other historical images, documents, and artifacts. "Having an exhibit about a building displayed in that same building allows viewers to see how it has changed over time, and to remember the innovative chemists who walked the same halls decades earlier," says Peter Collopy, Caltech's archivist and head of special collections. 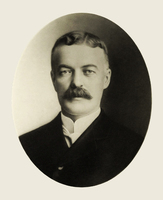 The exhibit traces the construction of the former laboratory building, which was funded by brothers and lumber magnates Charles Warner Gates and Peter Goddard Gates. Gates Laboratory of Chemistry remained a hub of research and teaching until the 1971 San Fernando earthquake left it so badly damaged that it had to be shuttered. The building remained empty for nearly a decade until funding from the Ralph M. Parsons and James Irvine foundations made possible its renovation as an administrative center. The building reopened in 1983. The display also focuses on some of the individuals whose work has made an impact on CCE and on the field of chemistry over the past century, starting with scientists who worked in the former Gates Laboratory of Chemistry. The exhibit includes an image of Arthur A. Noyes; notes and sketches by Linus Pauling; a quotation from Caltech's first female graduate student, Dorothy Semenow; and a replica of Ahmed Zewail's Nobel medal. A digital version of the exhibit can be viewed online at Story of a Building and Building a Division. The exhibit, on the second floor of Parsons-Gates, can be visited Monday through Friday, from 8:30 a.m. to 4:30 p.m.
For more information on Caltech's history, visit the Institute's interactive history map and the Caltech Archives.